Rohatsu is Japanese for "eighth day of the twelfth month." December 8 has come to be the day Japanese Zen Buddhists observe the enlightenment of the historical Buddha. Traditionally, this observation -- sometimes called "Bodhi Day" -- was held on the 8th day of a 12th lunar month, which often falls in January. When Japan adopted the Gregorian calendar in the 19th century, Japanese Buddhists adopted fixed days for many holidays, including Buddha's birthday. Western Buddhists of many schools appear to be adopting December 8 as Bodhi Day, also. Bodhi means "awakened" in Sanskrit, although in English we tend to say "enlightened." In Japanese Zen monasteries, Rohatsu is the last day of a week-long sesshin. A sesshin is an intensive meditation retreat in which all of one's waking time is dedicated to meditation. Even when not in the meditation hall, participants endeavor to maintain meditation focus at all times -- eating, washing, doing chores. Silence is maintained unless speaking is absolutely necessary. In a Rohatsu Sesshin, it is traditional for each evening's meditation period to be longer than the previous evening's. On the last night, those with enough stamina sit in meditation through the night. The Buddha's enlightenment is observed at different times in other parts of Asia. For example, Theravada Buddhists of Southeast Asia commemorate the Buddha's birth, enlightenment and passing into Nirvana at death on the same day, called Vesak, which is usually in May. Tibetan Buddhists also observe these three events in the life of the Buddha at the same time, during Saga Dawa Duchen, which usually is in June. According to the classic story of the Buddha's enlightenment, after several years of fruitless searching for peace, the future Buddha, Siddhartha Gautama, became determined to realize enlightenment through meditation. He sat beneath a bodhi tree, or sacred fig (Ficus religiosa), and entered deep meditation. As he sat, he was tempted by the demon Mara to give up the quest. Mara brought his most beautiful daughters to seduce Siddhartha, but he did not move. 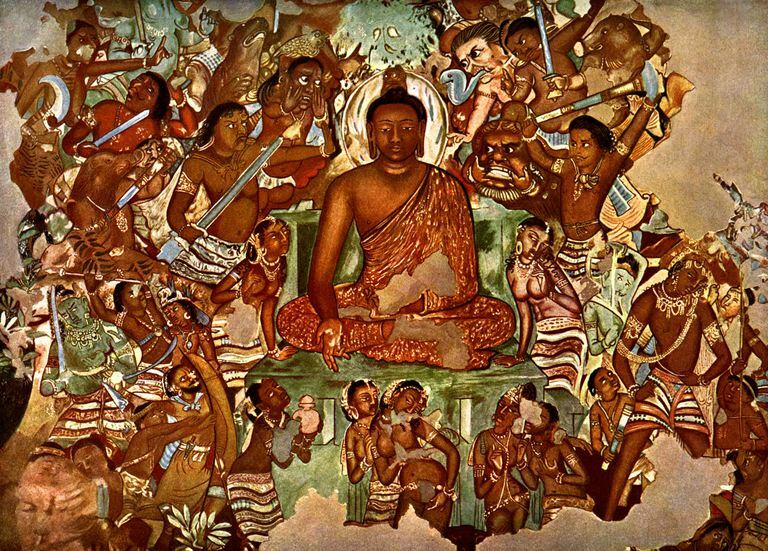 Mara sent a demon army to frighten Siddhartha from his meditation seat. Again, Siddhartha did not move. Mara then conjured a vast army of terrifying demons, who ran screaming toward Siddhartha. Siddhartha did not move. Finally, Mara challenged Siddhartha by demanding to know by what right he claimed enlightenment. Mara boasted of his own spiritual accomplishments, and his demon army cried out, "We bear witness!" "Who will speak for you?" Mara demanded. Then Siddhartha reached his right hand down to touch the earth, and the earth itself roared, "I bear witness!" Then the morning star rose in the sky, and Siddhartha realized enlightenment and became the Buddha.